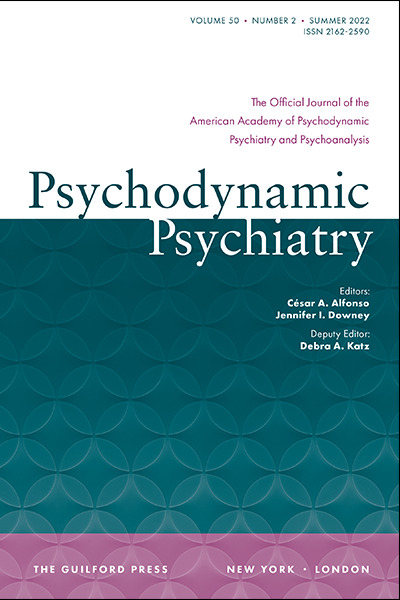 A subscription is included with membership in The American Academy of Psychodynamic Psychiatry and Psychoanalysis. Formerly The Journal of the American Academy of Psychoanalysis and Dynamic Psychiatry, ISSN 1546-0371, Volumes 1–39. Starting with Volume 40, Psychodynamic Psychiatry is the re-envisioned journal of the American Academy of Psychodynamic Psychiatry and Psychoanalysis. The journal focuses on psychodynamically informed approaches to assessment, diagnosis, and psychotherapy, as well as psychoanalysis as a distinct form of treatment. In addition to narrative clinical discussions, the journal showcases noteworthy research in such areas as psychotherapy process and outcomes, the biopsychosocial etiologies of psychopathology, and mechanisms of coping and resilience.